My most recent tech panel (CTRL-ALT-TECH on the first day of SXSWi ) was on the topic "All Things Storage". As part of that panel I brought along a little slice of storage history: an Apple ProFile from one of my two Apple III systems -- the computer that launched me into programming all those years ago. 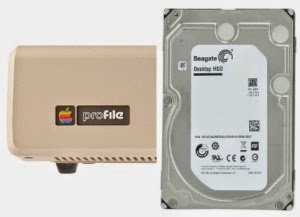 Apple ProFile -- a box of storage "firsts"
The world's first 5.25" hard drive format -- still the standard for desktop PCs today. The ProFile sold for $3,500 and provided 5MB of storage space. To contrast that I then brought out a basic USB thumb drive I'd bought the day before. This was to help emphasize my (eventual) point regarding low cost ensuring the continued ubiquity of localized storage versus a widespread migration to cloud storage. To emphasize "ubiquity" I went to a grocery store rather than a consumer electronics store and found a USB drive hanging in the "impulse buy" section at the checkout counter. I bought 4 GB of storage for $6.97. The math on my purchase roughly equates to $0.01 buying 5.88 MB. In other words, one penny now buys an entire Apple ProFile. Far removed from Seagate's intial 5 MB hard drive offering back in 1980, the company's newest drive provides a staggering 6 TB of storage in that same 5.25" drive format. 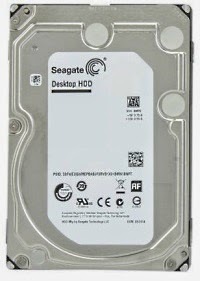 Presently I can order this drive online for $299.99 with free shipping and no tax. One penny now buys 209.72 MB of storage. I think "wow" about sums it up.